e tree should remain healthy but its ability to defend itself against fungal attack is diminished. If damage occurs the tree may in time become hollow. In botany, a bud is an undeveloped or embryonic shoot and normally occurs in the axil of a leaf or at the tip of the stem. Once formed, a bud may remain for some time in a dormant condition, or it may form a shoot immediately. 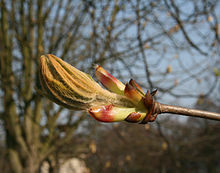 Buds may be specialized to develop flowers or short shoots, or may have the potential for general shoot development. The term bud is also used in zoology, where it refers to an outgrowth from the body which can develop into a new individual. The buds of many woody plants, especially in temperate or cold climates, are protected by a covering of modified leaves called scales which tightly enclose the more delicate parts of the bud. Many bud scales are covered by a gummy substance which serves as added protection. When the bud develops, the scales may enlarge somewhat but usually just drop off, leaving on the surface of the growing stem a series of horizontally-elongated scars. By means of these scars one can determine the age of any young branch, since each year's growth ends in the formation of a bud, the formation of which produces an additional group of bud scale scars. Continued growth of the branch causes these scars to be obliterated after a few years so that the total age of older branches cannot be determined by this means. On the left is an opening inflorescence bud, that will develop like the one to the right. In many plants scales are not formed over the bud, which is then called a naked bud. The minute underdeveloped leaves in such buds are often excessively hairy. Naked buds are found in some shrubs, like some species of the Sumac and Viburnums (Viburnum alnifolium and V. lantana) and in herbaceous plants. In many of the latter, buds are even more reduced, often consisting of undifferentiated masses of cells in the axils of leaves. A terminal bud occurs on the end of a stem and lateral buds are found on the side. A head of cabbage (see Brassica) is an exceptionally large terminal bud, while Brussels sprouts are large lateral buds.